In only 11% minutes, the Saturn V had accelerated the Apollo spacecraft to nearly 8 kilometres per second. The length of the stack had been reduced by two-thirds and the remaining stage, along with the spacecraft, had been lifted to an altitude of 170 kilometres above Earth and above the vast majority of the atmosphere though by no means out of it completely. It was in orbit and the crew were experiencing weightlessness. They had just less than three hours to give their ship a thorough checkout before being sent Moonward with an engine burn called translunar injection (TLI), and no one was keen to ignite it unless they knew it was sending a good ship. In that time, they would make not quite two orbits of Earth although, if required, there was a contingency for an extra orbit. 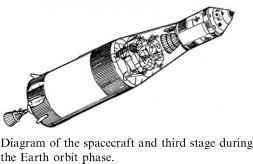 As soon as the J-2 engine at the rear end of the S-IVB third stage had shut down, tiny auxiliary rocket engines at the base of the stage's skin burned for a minute or so in an effort to keep the propellants settled at the bottom of their tanks. Other small manoeuvring engines began to operate to ensure that the stage would always point in the direction of travel with the spacecraft's windows facing Earth and its optical systems facing the stars. Once everything had settled down, a valve was opened to allow hydrogen gas from the S-IVB's supercold fuel tank to safely vent to space as heat leaked in and caused the fuel to boil. 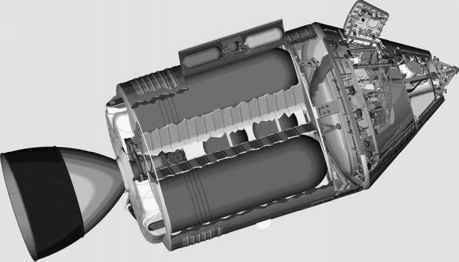 This venting was arranged so that the gas departed to the rear of the stage, where it acted like a very weak rocket thruster and provided a very small propulsive force that continued to keep the propellants settled at the bottom of their tanks long after the auxiliary thrusters had stopped.